Sabratha is a magnificent ancient city which is now buried in ruins, but remains one of the most respected, important and popular tourist attractions in Libya. Sabratha is a former Phoenician capital, which at the dawn of the new age, and even before that was one of the most important cities in this region. The Phoenician resort is considered one of the "three cities" of Libya. Situated on the shores of the Mediterranean, Sabratha was an important port. 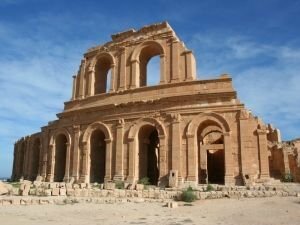 Today, ancient ruins and the modern city Sabratha are located in the north of the country, about 50 km west of Tripoli. The Libyan capital leads to Sabratha easily - you only to take the path north along the Mediterranean. The whole complex is a wonderful combination of narrow streets, temples, Phoenician city buildings, complemented by beautiful pieces of Corinthian columns. In 1982, Sabratha was included in the list of World Heritage sites by UNESCO. Founded in 5-6 century by the Phoenicians, the ancient centre flourished around the 2nd century after the new age, during the Roman Empire. As an important commercial and cultural center Sabratha is formed mostly during the reign of Emperor Septimus Severus, who was originally from nearby Leptis Magna. At the time, Sabratha, Leptis Magna and then city Oea (now Tripoli), were united under the name of Tripolis. These settlements were primarily for the Roman Tripolitania province. 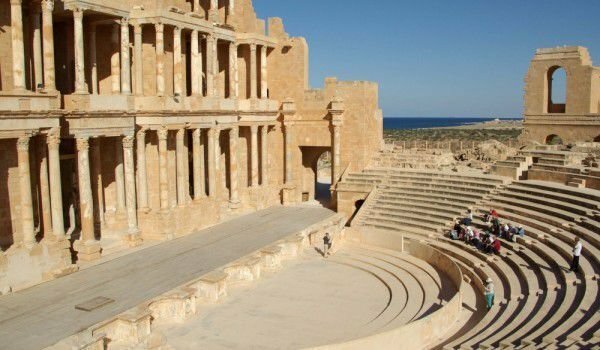 According to historians, Sabratha is that of the three cities that have the least resources, but today the village is renowned for its huge Roman theater. This ancient arena is very well maintained and at present, it is top among the sights of Sabratha. As a thriving Roman city Sabratha fails to hold for long, like Leptis Magna and almost all Roman settlement in North Africa, which are destroyed during the invasion of the Arabs. Additionally a huge earthquake in 365 destroyed much of the buildings. Then they are partially restored, but Sabratha never fully regained its glory and power. During the Byzantine era Sabratha has been expanded with several new buildings. Gradually, the once thriving trading city shifted to other ports and it has become a deserted village. Undeniable landmark in today's Sabratha is the Roman theater, which was erected at the end of the 3rd century during the reign of Emperor Commodus. This Roman theater is incredibly impressive - its scene was built on three levels, which are connected by magnificent marble columns. Sabratha is a theater with a capacity of about 5 000. Here you can see many reliefs and decorations depicting historical scenes. Near the theater Sabratha is an arena where they once were held gladiator fights. Today well-preserved underground passages, through which they entered remain. Other interesting monuments at Sabratha are the Basilica of Justinian, Capitolium, Temple of Isis, Temple of Saraphis, as well as that of Hercules.